Be the first to hear about their new releases and deals. 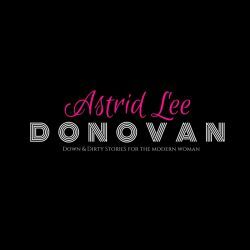 Download the Booksprout app and search for Astrid Lee Donovan today! Astrid began writing as soon as she could hold a pencil. While her early tales contained much different themes than the hot and heavy romances she writes today, her passion for fiction was clear right from the start. Astrid's work these days focuses on the female perspective when dealing with exciting new situations. Her stories are full of tough guys, alpha males, dominant billionaires and bikers. While the heroines of her stories are always in charge of their own destiny, they sometimes are pushed to their limits. After more than a decade of living in the wilds of BC, Canada, Astrid now makes her home in the exciting metropolis of Toronto. There, when not writing, you'll find her hanging out with her daughter at the nearest playground or with her hubby enjoying one of the many cultural festivals that the city has to offer.